All the Izumicon Info and Links You Need Below Izumicon is an Oklahoma Anime Event that you don’t want to miss Aug 31-Sep 2, 2018. We have all the details for Izumicon on our site. Get Izumicon Tickets, Izumicon Map & Directions, Schedules and all the other Izumicon Information you could need. We also have Anime Costume Ideas like this Hellsing Vampire Alucard Costume & Accessories. Stay tuned to Dallas Vintage Shop’s ‘ZYX DFW Costume Events’ Category for all the cool Anime & Cosplay and other cool Costume Events in the Metroplex, Week by Week & Month by Month. Save us, Share us and revisit us whenever you are in the mood to attend a costume event. “Izumicon is also under new ownership. Hopefully, you’re as excited as we are for what we have in store. :) Getting back to its roots, Izumicon 2018 is back at its old stomping grounds at Midwest City’s Reed Center, which means free parking and lower costs for you! Izumicon 2018 NEWS: Izumicon, Aug 31 10:00 AM to Sep 2 at 06:00 PM @Reed Conference Center, 5800 Will Rogers Road, Oklahoma City, Oklahoma 73110. This Death Note Ryuk Shinigami Demon Costume is only one of over a Thousand we have in stock. 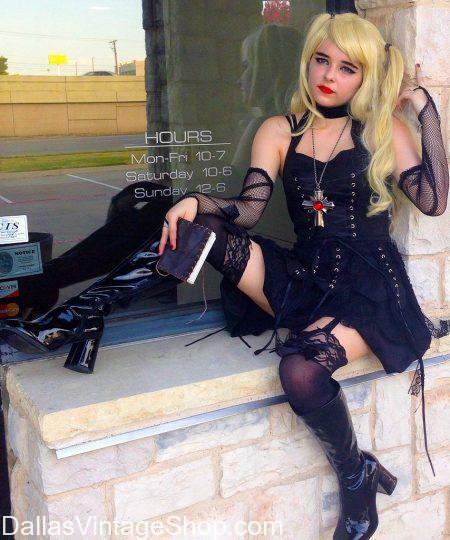 Dallas Vintage Shop is the source for Anime Events in the Metroplex. All you need to know about Izumicon, like Event Times & Dates, Tickets, Costume Contest Info, Maps and Izumicon Schedules and Details. We even provide links to the Official Izumicon Website & Anime Event Costume Suggestions. There have tons of complete Anime & Cosplay Costumes at Dallas Vintage Shop. Costume Events are our business, so save us, share us, and check our Events Category for Anime Events, Week by Week & Month By Month. At our Costume Shop, you will find Anime Event Costumes, Cosplay Event Costumes & More. “Izumicon 2018 is also under new ownership. Hopefully, you’re as excited as we are for what we have in store. :) Getting back to its roots, Izumicon 2018 2018 is back at its old stomping grounds at Midwest City’s Reed Center, which means free parking and lower costs for you! We Have All You Need for Izumicon Anime Convention Costumes Find other High-Quality Steampunk & Game Costumes for Izumicon @ Reed Conference Center, 5800 Will Rogers Road, Oklahoma City, Oklahoma 73110, Aug 31 10:00 AM to Sep 2 at 06:00 PM. This Post has all you need to know about Izumicon. Get Izumicon Tickets, Times & Dates, Directions, Website Links and even Izumicon Costume Suggestions from Dallas Vintage Shop. You can find thousands of Anime & Cosplay Costume Creations in our One Stop Costume Shop. Discover Complete Outfits or just the Wigs, Makeup and Accessories you need. “Izumicon Anime Convention is also under new ownership. Hopefully, you’re as excited as we are for what we have in store. :) Getting back to its roots, Izumicon Anime Convention 2018 is back at its old stomping grounds at Midwest City’s Reed Center, which means free parking and lower costs for you! What is Izumicon Anime Convention? Looking for an Entertaining Event in Midwest City, OK? Check out the Izumicon Anime Expo. We Have Complete Details For the Izumicon Event Listed and Linked Below. Here you will find Event Times & Dates, Event Locations & Maps, Event Ticket Connections & Official Event Website Links. Izumicon @ Reed Conference Center, 5800 Will Rogers Road, Oklahoma City, Oklahoma 73110; Aug 31 10:00 AM to Sep 2 at 06:00 PM. We are dedicated to Costume Events DFW & North Texas. Get Everything you need about Costume Events right here. Dallas Vintage Shop can provide Costume Event Suggestions. Like this Sailor Moon Tuxedo Mask Cosplay. Find Tons of Anime and Cosplay costumes! If Super Hero & Super Villain are more your thing, we have Both and kids costumes too. Get complete outfits or just the pieces you need. We are here for you all year round with Costume Event Listings & Costumes Galore. “Izumicon Anime Expo is also under new ownership. Hopefully, you’re as excited as we are for what we have in store. :) Getting back to its roots, Izumicon Anime Expo 2018 is back at its old stomping grounds at Midwest City’s Reed Center, which means free parking and lower costs for you! What is Izumicon Anime Expo? Izumicon Midwest City INFO: Izumicon, Aug 31 10:00 AM to Sep 2 at 06:00 PM @Reed Conference Center, 5800 Will Rogers Road, Oklahoma City, Oklahoma 73110. We have all the Izumicon Dates and Times, Izumicon Maps, and Izumicon Schedules to make the Weekend of Aug 31- Sep 2, 2018 your favorite time! Visit Dallas Vintage Shop for Classic Anime and Cosplay Costume Ideas, Like this Sailor Moon Cosplay. We Also have Group & Couples’ Cosplay Ideas whether you are looking for Anime, Superheroes, or anything as there are literally thousands of Ideas here! Come into the Shop and let our Helpful Staff find the Perfect Cosplay for Izumicon. “Izumicon Midwest City is also under new ownership. Hopefully, you’re as excited as we are for what we have in store. :) Getting back to its roots, Izumicon Midwest City 2018 is back at its old stomping grounds at Midwest City’s Reed Center, which means free parking and lower costs for you! What is Izumicon Midwest City? We have all the costumes for “Oklahoma!” the Rodgers & Hammerstein Production. We have costumes for all the cowboys and farmers. This Curly Costume is only one idea we have in stock for all the male characters, Real leather cowboy chaps and period dungarees, neck scarves, vests, boots, spurs and more. We have all you need for the ladies cast too. Any Broadway production, any movie, any characters. We have some fancy Rodgers & Hammerstein’s ‘Oklahoma!’ Movie Musical Characters Period Attire. Any character, any accessory. full cast, just the main characters or just the hard to find pieces. What is your favorite Movie Musical? We have costumes & accessories for that too. Need Theatrical or High School Drama Troupe Period Attire? This is one idea of a wedding dress for ‘Oklahoma’, Rodgers & Hammerstein, Laurey Wedding Dress Costume. We have more simple wedding dress ideas too. This is also great for Seven Brides. for Seven Brothers, Texas, The Musical and so many more. We have all the Outfits for men, women, boys & girls for theatrical or school history projects. Out wigs, hats, makeup selection, gloves, shoes and other accessories are unimaginably plentiful and diverse. Create your own wardrobe or get the hard to find pieces you like. You are in Oklahoma category.